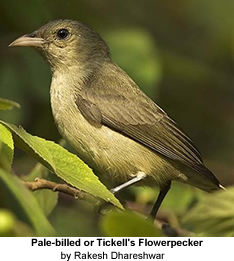 The Flowerpeckers are found in tropical southern Asia and Australasia from India east to the Philippines and south to Australia. 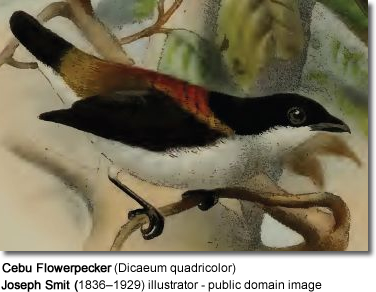 Flowerpeckers are very small birds - averaging 10 to 18 cm in length including their short tails. They are often brightly colored birds with short thick curved beaks and tubular tongues that are adapted for nectar feeding. Males have brighter, more beautiful plumage details, while the females are mostly olive green. Flowerpeckers mainly feed on nectar, as well as small berries, spiders and insects. The average clutch consists of 2-4 eggs, laid in a purse-like nest that is suspended from a tree. Photo, Video and/or Article contributions are welcome!